The profitability of any industry, in any technological sector - power, process, manufacturing, mineral extraction, transport, communication, etc - will be profoundly influenced by the reliability and performance of the plant which it uses. It is therefore vital that all possible measures are taken to maximise the productivity in use, and to minimise the maintenance costs and the downtime, of that plant. This book explains, in a clear and concise manner, the various organization structures that are needed for doing just that, the information systems with which those structures will need to be resourced, and the steps that will have to be taken in order to bring those structures and systems into being. The author, Anthony Kelly, an experienced international consultant and lecturer on this subject, calls his approach BUSINESS-CENTRED MAINTENANCE (BCM) because it springs from, and is driven by, the identification of business objectives, which are then translated into maintenance objectives and which underpin the maintenance strategy formulation. 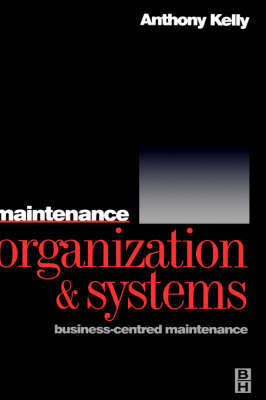 For the first time maintenance management is analysed from the perspective of the whole company and thus makes sense not only technologically but also in economic and business terms.